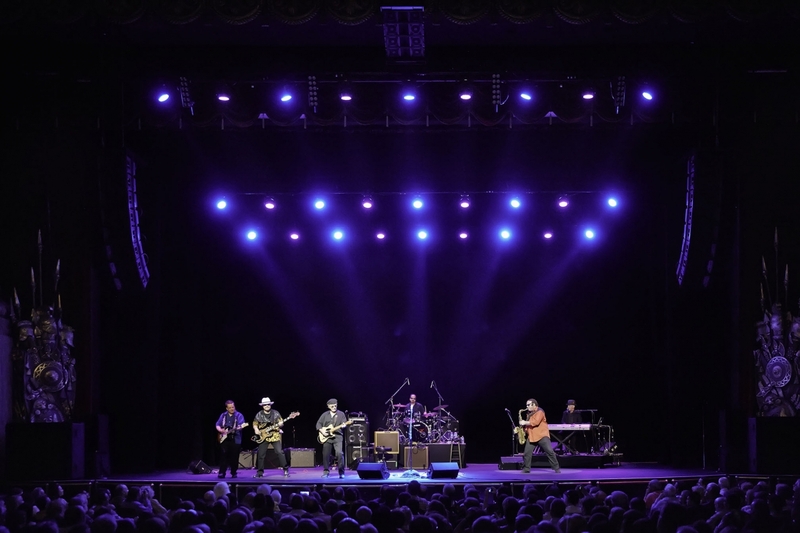 Historic Beacon Theatre Purchases Lighting Package from 4Wall New York | Press Center | 4Wall Entertainment, Inc.
New York, NY- The historic Beacon Theatre recently upgraded its lighting with a package of brand new products from 4Wall New York. Long renowned for its audio experience, the theatre chose Martin MAC Auras, Philips Showline SL Bar 620s, and an MA Lighting grandMA2 Console as the pieces that would enhance the visual experience of patrons for years to come. The Beacon Theatre, a 2,800-seat venue located at Broadway and 74th street in Manhattan, was built in 1928 and designed in the art deco styling of the day by architect Walter Ahlschlager. The ornate architectural design of the Beacon dictates to the design team what lighting positions are possible. Clinton Neils, Vice President and General Manager of the Beacon Theatre, spoke of the challenges faced by the team as they worked to re-design the lighting experience. "The challenge was in finding a system that could work for all types of events, including concerts, comedy, theatricals, industrials, TV shoots, movie premieres, sporting events, and various other special events. We needed a system that would provide dynamic lighting on its own, yet could be easily integrated with touring productions carrying their own lighting systems." The team observed the lighting industry both inside and outside of The Beacon, taking note of fixtures artists were touring with, as well as what appealed to lighting designers. Additionally, factors such as service life, ease of maintenance, brand reputation, and quality of manufacturing played into the final decision to purchase MAC Auras along with a grandMA2 console. "The MAC Aura and grandMA2 are highly regarded as workhorses in the industry," said Neils, "They are constructed by well-known manufacturers with a reputation for producing quality products." Sticking with the theme of LED fixtures, the team sought out an audience blinder that could match the look of a traditional eight-lighter while exceeding expectations. Philips brand new Showline SL Bar 620 impressed the crew, and was purchased to provide quick flash audience blinding along with the ability to color mix and match the overstage wash.
As important to the Beacon team as the fixtures themselves, were the company they purchased from and the ongoing service and support that would be necessary after the purchase. In choosing 4Wall New York, they found that the company's relationship with the manufacturers ensured an extra level of support for them as a client. "We knew that 4Wall's inventory was extensive and would offer a large selection for the Beacon Theatre," said Neils. "In addition, we knew that the process would be smooth, mostly because 4Wall's best asset is their people they know the business and they know the gear. 4Wall has provided all materials in a timely manner, services the equipment and most importantly, stands behind everything they sell."